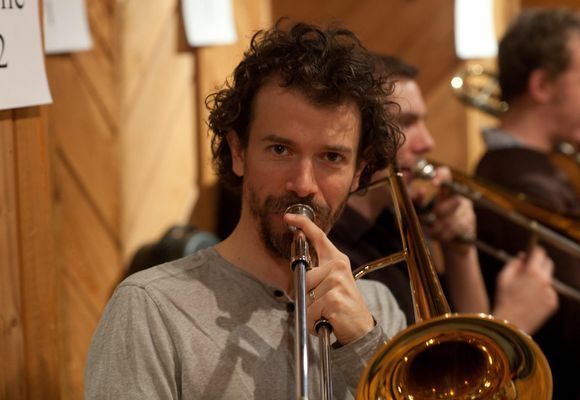 Recently named the #1 Rising Star Trombonist in Downbeat's annual critics poll and hailed by the New York Times as "a young trombonist of vision and composure", few musicians have managed to navigate the richly varied avenues of New York City's abundant music scene with the same passion and adaptability as trombonist and composer Ryan Keberle. Since moving to New York City from Spokane in 1999, Keberle's diverse talents have earned him a place alongside a staggering array of legends, superstars, and up-and-coming innovators including David Bowie, Wynton Marsalis, Alicia Keys, Maria Schneider, and Sufjan Stevens. Leading his pianoless quintet Catharsis, the all-star Big Band Living Legacy Project, or arranging for the little big band setting of his Double Quartet, Keberle draws upon lessons learned playing alongside masters of a multitude of forms, from jazz legends to indie rock ground-breakers, R&B superstars to classical virtuosos. He has toured with the acclaimed indie rock songwriter Sufjan Stevens and with the ground-breaking big bands of Maria Schneider and Darcy James Argue; he has accompanied soul hitmakers Alicia Keys and Justin Timberlake as well as jazz legends Rufus Reid and Wynton Marsalis; he's been heard on movie soundtracks for filmmakers like Woody Allen and in the pit for the Tony-winning Broadway musical "In the Heights." Aside from his successful performance career, Keberle serves as a leading jazz educator in New York City and beyond. In 2001 Mr. Keberle was selected as the artistic director for New York City’s first youth jazz orchestra, Jazz Band Classic. The band made its premiere with Jimmy Heath in Aaron Davis Hall, and finished its season with an appearance by Slide Hampton in Carnegie Hall. Since 2004 Ryan has directed the burgeoning jazz program at City University’s Hunter College.